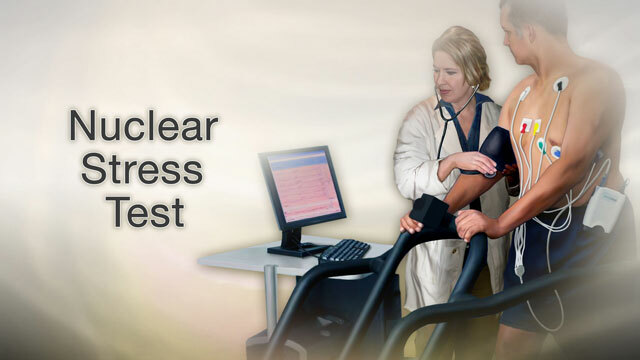 Nuclear stress test is an imaging method that uses radioactive material to show how well blood flows into the heart muscle, both at rest and during activity. You will have an intravenous (IV) line started. If you are not able to exercise, you may be given a medicine called a vasodilator (such as adenosine or persantine). This drug widens (dilates) your heart arteries. Your provider will compare the first and second set of pictures using a computer. This can help detect if you have heart disease or if your heart disease is becoming worse. You should wear comfortable clothes and shoes with non-skid soles. You may be asked not to eat or drink after midnight. You will be allowed to have a few sips of water if you need to take medicines. If you are given the vasodilator drug, you may feel a sting as the medicine is injected. This is followed by a feeling of warmth. Some people also have a headache, nausea, and a feeling that their heart is racing. If you are given medicine to make your heart beat stronger and faster (dobutamine), you may have a headache, nausea, or your heart may pound faster and more strongly. If any of these symptoms occur during your test, tell the person performing the test right away. The test is done to see if your heart muscle is getting enough blood flow and oxygen when it is working hard (under stress). How well a treatment (medicines, angioplasty, or heart surgery) is working. If you are at high risk for heart disease or complications. If you are planning to start an exercise program or have surgery. The cause of new chest pain or worsening angina. What you can expect after you have had a heart attack. A normal test most often means that you were able to exercise as long as or longer than most people of your age and gender. You also did not have symptoms or changes in blood pressure, your ECG or the images of your heart that caused concern. A normal result means blood flow through the coronary arteries is probably normal. Reduced blood flow to a part of the heart. The most likely cause is a narrowing or blockage of one or more of the arteries that supply your heart muscle. Scarring of the heart muscle due to a previous heart attack. Your provider will explain the risks before the test. In some cases, other organs and structures can cause false-positive results. However, special steps can be taken to avoid this problem. 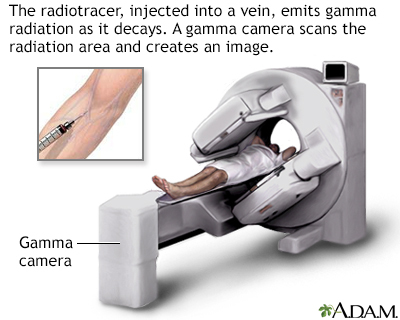 You may need additional tests, such as cardiac catheterization, depending on your test results. Udelson JE, Dilsizian V, Bono RO. Nuclear cardiology. In: Zipes DP, Libby P, Bonow RO, Mann DL, Tomaselli GF, Braunwald E, eds. Braunwald's Heart Disease: A Textbook of Cardiovascular Medicine. 11th ed. Philadelphia, PA: Elsevier; 2019:chap 16.